The flexible Drool Disc™ is manufactured from a high-temperature, composite material designed and engineered specifically to deflect drool away from the nozzle. Laser cut and silicone sealed for clean room environments, it installs in seconds with no down time! New Perforated Slots provide greater flexibility. 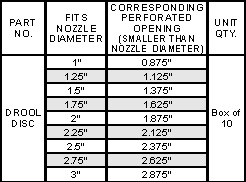 Fits nozzle diameters from 1" to 3". Modified closed-cell copolymer. Foam cast directly between a lightweight fiberglass and a slightly heavier fiberglass. Coated with silicone resin.